It’s been one of those weeks and as so often is the case there is no better therapy than a nice bicycle ride. I’ve been pining to get back to the mountains and while I set out too late to really get into the Cascades I did make it to the foothills. I ended up following the Mountain to Sound Greenway which is a sequence of trails interspersed with road riding: I-90 Trail -> Issaquah-Preston Trail -> Preston-Snoqualmie Trail with a brief sojourn on the East Lake Sammamish Trail. While separating one from traffic (and I-90 which this route parallels most of the time) these trails are usually wedged in where they can and are thus a lot hillier than one might expect. The Preston-Snoqulamie tail is a genuine rail-trail which runs nice and flat except where bridges are gone (such as over the Raging River Valley). I wanted to get to the Issaquah-Preston Trail which is one of my favorite mixed-terrain routes. This trail is a rocky dirt path paralleling I-90 that ends (appropriately enough) at Preston. From there you an take one of the best paved trails in the state The Preston-Snoqualmie trail which is a rare paved trail in the woods. These are all routes I’ve ridden many times and have reported on more than once in these pages but I think this was the latest autumn ride I’ve done on this route. The paths, especially the more wooded sections were deeply buried in multi-colored leaves which was beautiful but rather buried the many large rocks on these trails. Still it was great to be in the cool mountain air, with the fog shrouded foothills looming above. I wish I’d set out early enough to ride further into the mountains – the dwindling light always a factor this time of year. 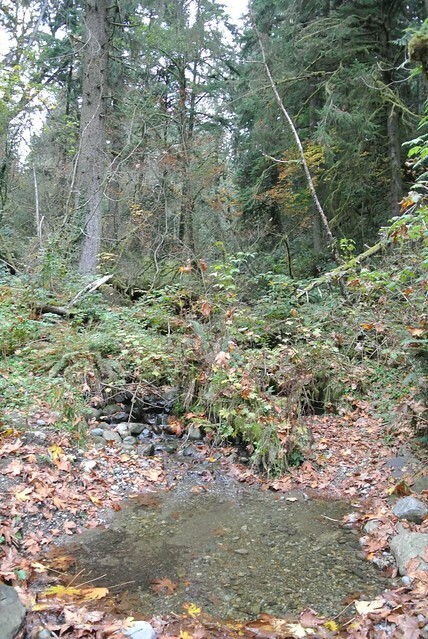 I only rode a couple of miles on the Preston-Snoqulamie Trail and decided to stop at a section of the trail that crosses a gorge above a stream. Of all the times I’ve ridden the trail I’ve never gone down to this stream which I rectified on this trip. It was pleasant here; this part of the trail has turned away from I-90 and I was down far enough that the few other users of the trail were mostly unnoticeable. After a bit of a break by the pools of water I backtracked down to Issaquah and had a couple of beers and some onion rings at the Issaquah Brewhouse. While I was there, a ‘Thriller’ “flash mob” broke out right in front of the pub which lasted the length of the song and as I returned to my bicycle broke up. On my ride east I was on the north side of the I-90 following the Mountain to Sound route, for my return west I stuck to the south side on the hillier route on the edge of Newport. But I had to back track on the I-90-Mercer Island-et al bit back home. I made it it home in the dark around 7:30 having done around 50 miles on this day. 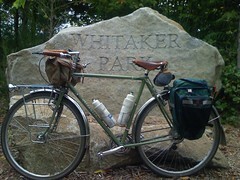 An even dozen photos from the ride can be found in my An Autumn Mixed-Terrain Ride on Flickrset on Flickr. As I reported earlier my chain broke the day before this ride so the day began with a ride down to the Kirkland branch of Montlake Bicycle Shop on my Safari. I picked up a new chain and some spare powerlinks and returned home to put these on. As I’ve reported before I’m rather adverse to the early start but for some reason I’ve been waking up early on Saturdays. Must be the excitement of not working. Anyway I had gotten up made breakfast did some web surfing, listened to some NPR and replaced my chain before heading out at 10 am. Still late by most cyclists standards, but leaving home before noon is early for me. It was fully overcast and somewhat cool with a chance of showers predicted so I put on wool socks and packed my rain jacket as I set out. This turned out to be a fortuitous choice. I knew from my earlier ride to Rattlesnake Lake that it would have been over 70 miles to the end of the tunnel (less for the return trip, hooray for loop rides) so I took what I knew was the shortest route there. 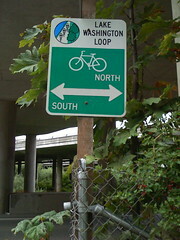 Pretty much I took the Lake Washington Loop to the I-90 trail, to Issaquah. This route is pretty suburban, especially the I-90 trail. You have to go through Bellevue on the Loop and then there is a nice section through a wooded area and at the I-90 bridge you turn onto the I-90 trail. This goes through Factoria, which is pretty much suburban hell. The trail pretty much isn’t a trail through most of Factoria and you ride on the bike lanes in the road and if you followed the signage, sidewalks. Otherwise you make your way through the car dealers, strip malls and parking lots. Eventually you get on a section of actual trail that runs parallel to the I-90. When going to Issaquah I don’t stay on it long and at a pedestrian overpass I cross over to Newport way. This is a nice downhill from this point which goes past the Zoo Hill climb turnoff, right into Issaquah. It’s about 17 miles total to Front Street about 4-5 miles less then the other route I take (Kirkland->Redmond->East Lake Sammamish Pkwy->Issaquah). It was during my time on the I-90 trail that I discovered that I hadn’t returned my SD card to my digital camera rendering it an expensive paperweight for this trip. Also I saw that I hadn’t recharged the iPhone for a number of days and it was only about half charged. There was not going to be much documentation of this trip. So some of these pictures are from my cameraphone but most of the ones of the trails are from that earlier trip. It was almost noon now and due to the early breakfast and riding I was ready for lunch. 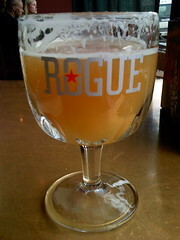 So back to my old friend, the Issaquah Brewhouse. This time I was early enough that there was no crowd. I got an Imperial Porter and ordered Fish Tacos right off. I followed this up with a Lindemans Pomme Lambic for desert 🙂 Still I ended up spending way too much time here. Service was slow and while I enjoyed the food and beer very much I spent too long here. 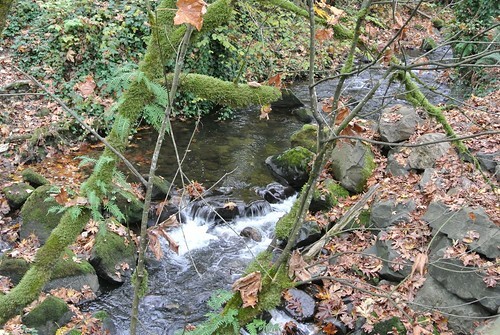 Especially as I then wandered around Issaquah looking for a place to buy an SD card. I didn’t succeed as I didn’t want to backtrack to the shopping malls. I figured I’d be able to find one in Snoqualmie, or North Bend or maybe the outlet mall up there. So after eating a strange ice cream cone that they squeezed out of a tube, I hit the road. Wending through the Issaquah streets I made my way to the beginning of the Issaquah-Highpoint trail. This trail starts at an I-90 freeway ramp that they basically have separated the shoulder from the street. It then turns into a very nice pedestrian overpass and a nice trailhead on the northern side. Then the trail proper begins, which is a hard packed dirt and gravel trail that runs through the woods along I-90. As with all of these old railways these constantly climb at a gentle rate. Not sure if I was just tired or what at this point but I found I was not making very good time on this trail. This was to repeat itself on all the trails I would ride this day. This trail runs by a stream and through the woods its short length (about 4 miles) and then ends at a little parking area just off a freeway ramp. From here you ride for another four miles or so on frontage roads until you reach the Preston-Snoqualamie trail. This frontage road opens with a short steep climb and then is rolling hills through some nice countryside, it curves away from I-90 so the freeway isn’t so dominating. The Preston-Snoqualmie trail is maybe my all time favorite trail. It is paved, it runs through woods away from the highway and is pretty lightly traveled. It has two distinct sections with a little bit on the shoulder of a road then a single-tracked switchback climb then another paved section through deep woods. The trail ends abruptly near a scenic overlook of Snoqualmie Falls. If one skits around the fence that blocks the end of the trail there is a path that continues for a ways then ends at an old train trestle over a serious gorge. The trestle seems very strong, and stable and I’ve walked a bit of a ways out on it. I’m not a big fan of heights but it did seem like you could walk all the way across it. If only they would continue the trail it would go right to Snoqualmie and would really improve the trip up the pass. As it is one has several options from this point. You can go back on the trail to the last road crossing and head down to Fall City. From their you can get on the Snoqualmie Valley trail up to Snoqualmie or take the Snoqualmie-Fall City road. Either way its quite a bit out of the way. The other option, which I did on this trip (and the previous for that matter) is to take a little hike up to Snoqualmie Ridge. Snoqualmie Ridge is this rather horrific housing community built up on a ridge outside of the (much more working class and quaint) city of Snoqualmie. It is centered around a golf course (don’t get me started) and the houses are all of that cookie cutter, same floorplan, different color, exact same sculpted lawn, housing association disaster. Kamazotz was supposed to be a warning not a model! Anyway on the far side of this monstrosity is a small park and a wood area. This is above the Preston-Snoqualmie trail and a number of trails run down through the woods connect the park to the regional trail. These trails are loosely packed dirt and beauty bark and seem to always be wet, heavy and pretty much a steep climb the whole way. So I tend to push my bicycle the bulk of the way which as it’s only a bit over a mile is perfectly fine. Still tough though, it’s amazing how much easier it i s to ride scores of miles, but pushing you bicycle uphill for a mile is a real corker. The path ends at Whitaker park which is open to Kamazotz on one side but an power line route to the north opens an amazing vista into Snoqualmie Valley. A real stunning view and after that hill a nice place for a break. Between Snoqualmie and the equally quaint town of North Bend is some road riding. You can of course find your way to the Upper Snoqualmie Valley Trail (head toward the falls and turn onto Tokul road) but I find the road route to be quicker, easier and a bit of a break from the trails. 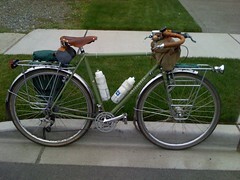 Plus I like to ride through Snoqualmie and North Bend. 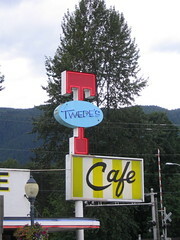 North Bend is where Twin Peaks was filmed and you ride right past the diner that was used for the exterior shots of the Mar T. You ride right through downtown North Bend taking a left at the light kittycorner from the Mar T. The road continues till it eventually intersects with the I-90. However after a bit a paved bicycle path appears on the right and if you follow that it turns onto a much less traveled suburban road. Following this route you end up at the same point as the road you were previously on but with a lot less travel. At the road where turning right takes you to the I-90 you go left and you’ll come right to an entrance of the Upper Snoqualmie Valley trail. It also turns out you can go right cross the freeway and with some stiff clinbing end up at the same place. Better route for the return trip, so it was the trail to me. 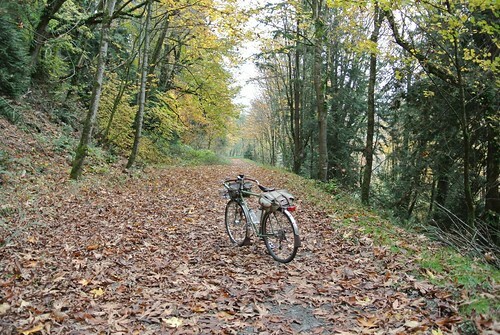 The Snoqualmie Valley Trail is a gravel surfaced trail that begins in Monroe way at the western end of the valley and slowly climbs all the way up to Snoqualmie. Then you do a bit of road and can get on the Upper Snoqualmie Valley trail, which runs through North Bend and ends at the state park at Rattlesnake Lake completing the trails 29 miles. When I hopped on the trail it was about 4-5 miles to Rattlesnake Lake. Again I was making pretty slow progress, the gravel and slight incline working against me. Also what with the long delay in Issaquah and the hunt for the SD card in Snoqualmie and North Bend I was pushing it for time. Finally I arrived at Rattlesnake Lake at around 4pm. 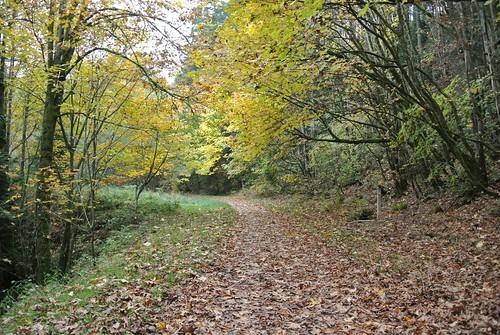 The Iron Horse State Park begins here with the John Wayne Memorial Trail. This park is basically a gravel path along the old Chicago-Milwaukee-St. Paul-Pacific Railroad route that stretches over a hundred miles all the way to the Columbia River. This parallels in part I-90 as it crosses Snoqualmie Pass. The Iron Horse Trail does that whole climb and then culminates in a two mile long tunnel through the mountain. Once through you have crossed the mountains and are in Eastern Washington. Stay tuned for the exciting trip through the tunnel and back. Until then check out my Flickr gallery from this ride and my gallery of this route on my cycling site.